Note: All code available on GitHub. For the version of the code that matches the details in this blog post, check out the master branch, v1.0.0 tag (after running git clone …, run a ‘git checkout tags/v1.0.0’ command). In Part One of this series, we introduced the microservices-based Virtual-Vehicles REST API example. The vehicle-themed Virtual-Vehicles microservices offers a comprehensive set of functionality, through a REST API, to application developers. The developers, in turn, will use the Virtual-Vehicles REST API’s functionality to build applications and games for their end-users. To review, the first five functions for each service are all basic CRUD operations: create (POST), read (GET), readAll (GET), update (PUT), delete (DELETE). The readAll function also has find, count, and pagination functionality using query parameters. Unfortunately, RestExpress does not support PATCH for updates. However, I have updated RestExpress’ PUT HTTP methods to return the modified object in the response body instead of the nothing (status of 201 Created vs. 200 OK). See StackOverflow for an explanation. In Part Two, we will build our four Virtual-Vehicles microservices. Recall from our first post, we will be using RestExpress. RestExpress composes best-of-breed open-source tools to enable quickly creating RESTful microservices that embrace industry best practices. Those best-of-breed tools include Java EE, Maven, MongoDB, and Netty, among others. 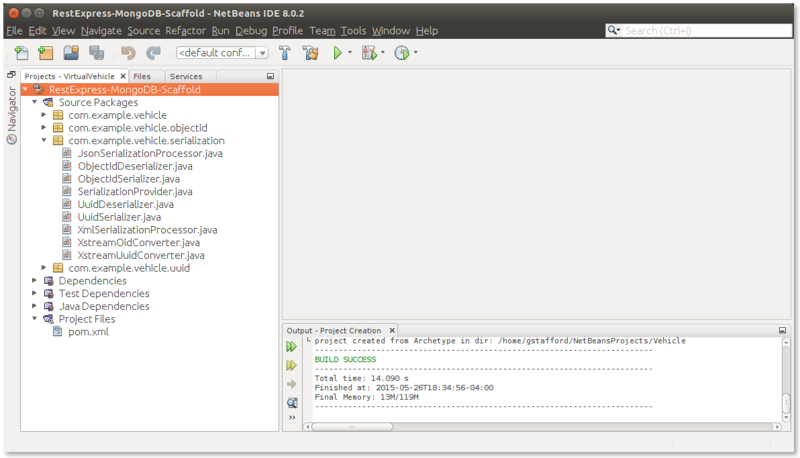 I used NetBeans IDE 8.0.2 on Linux Ubuntu 14.10 to build the microservices. You may also follow along in other IDE’s, such as Eclipse or IntelliJ, on Mac or Windows. We won’t cover installing MongoDB, Maven, and Java. I’ll assume if your building enterprise applications, you have the basics covered. All the code for this project is available on GitHub. However, to understand RestExpress, you should go through the exercise of scaffolding a new microservice using the RestExpress MongoDB Maven Archetype. You will also be able to use this default microservice project to compare and contrast to the modified versions, used in the Virtual-Vehicles example. The screen grabs below demonstrate how to create a new microservice project using the RestExpress MongoDB Maven Archetype. 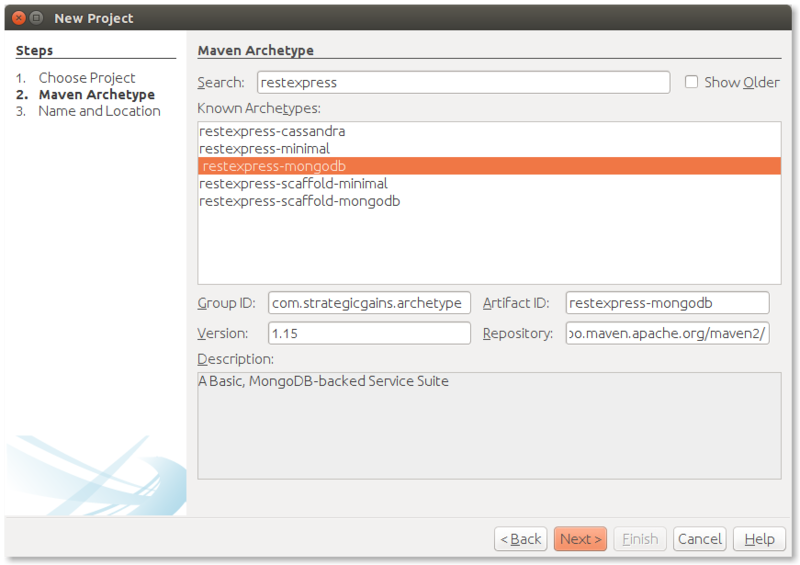 At the time of this post, the archetype version was restexpress-mongodb version 1.15. Again, I strongly recommend reviewing each of these package’s classes. To understand the core functionality of RestExpress, you must understand the relationships between RestExpress microservice’s Route, Controller, Service, Repository, Relationships, and Entity classes. 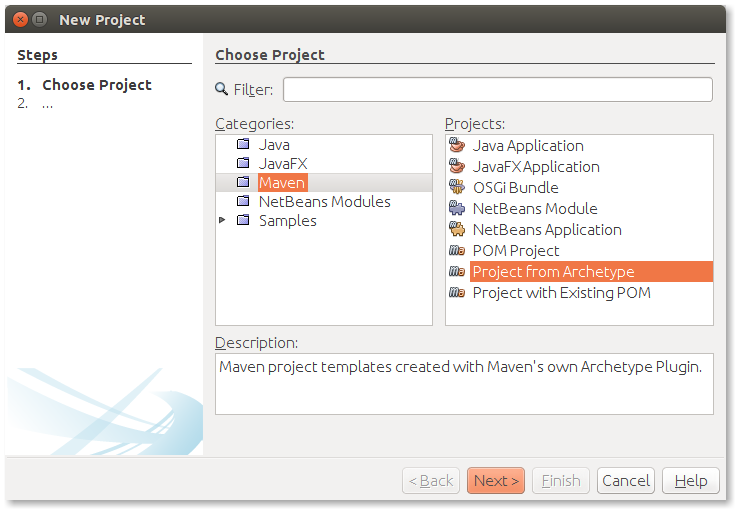 In addition to reviewing the default Maven project, there are limited materials available on the Internet. I would recommend the RestExpress Website on GitHub, RestExpress Google Group Forum, and the YouTube 3-part video series, Instant REST Services with RESTExpress. Disappointingly, the current RestExpress MongoDB Maven Archetype sample project does not come with sample JUnit unit tests. I am tempted to start writing my own unit tests if I decided to continue to use the RestExpress microservices framework for future projects. 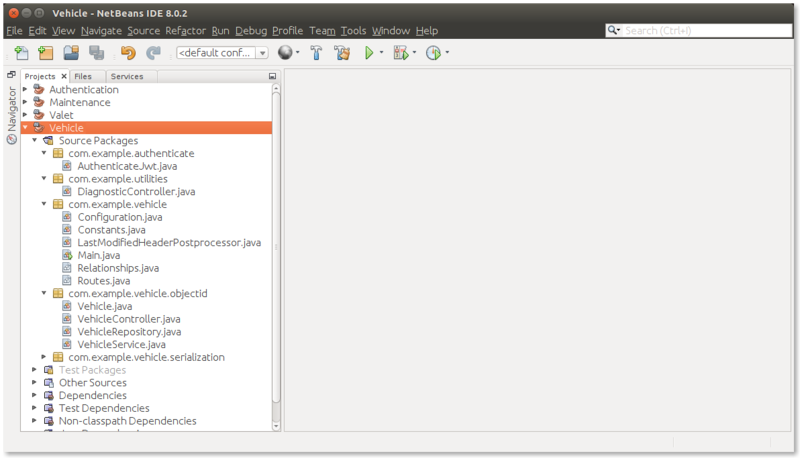 Also included in the default RestExpress MongoDB Maven project is a Java properties file (environment.properties). This properties file is displayed in the Files tab, as shown below. 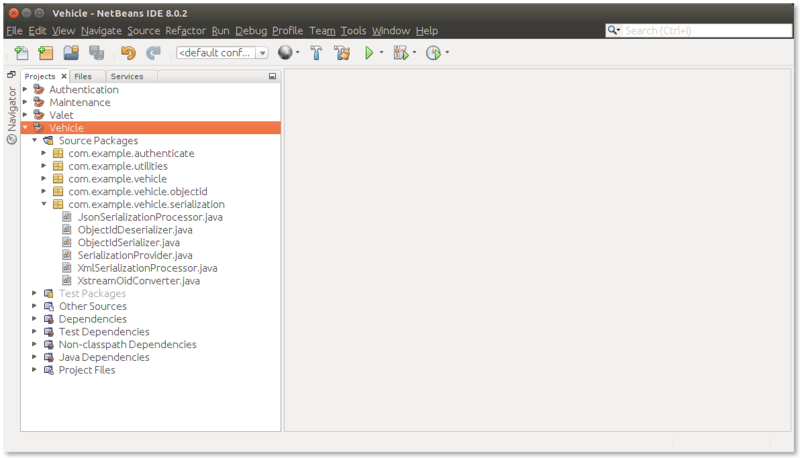 The default properties file is located in the ‘dev’ environment config folder. Later, we will create an additional properties file for our production environment. Within the ‘dev’ environment, each microservice is configured to start on separate ports (i.e. port = 8581). Feel free to change the service’s port mappings if they conflict with previously configured components running on your system. Be careful when changing the Authentication service’s port, 8587, since this port is also mapped in all other microservices using the authentication.port property (authentication.port = 8587). Make sure you change both properties, if you change Authentication service’s port mapping. Also, in the properties files is the base.url property. This property defines the URL the microservice’s endpoints will be expecting calls from, and making internal calls between services. In our post’s example, this property in the ‘dev’ environment is set to localhost (base.url = http://localhost). 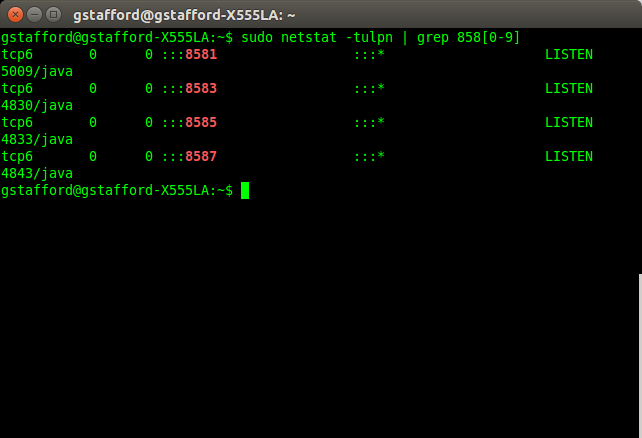 You could map an alternate hostname from your hosts file (/etc/hosts). We will do this in a later post, in our ‘prod’ environment, mapping the base.url property to Virtual-Vehicles (base.url = http://virtual-vehicles.com). In the ‘dev’ environment properties file, MongoDB is also mapped to localhost (i.e. mongodb.uri = mongodb://virtual-vehicles.com:27017/virtual_vehicle). RestExpress also uses the properties file to hold configuration properties for Metrics Plugin and Graphite. The Metrics Plugin and Graphite are both first class citizens of RestExpress. 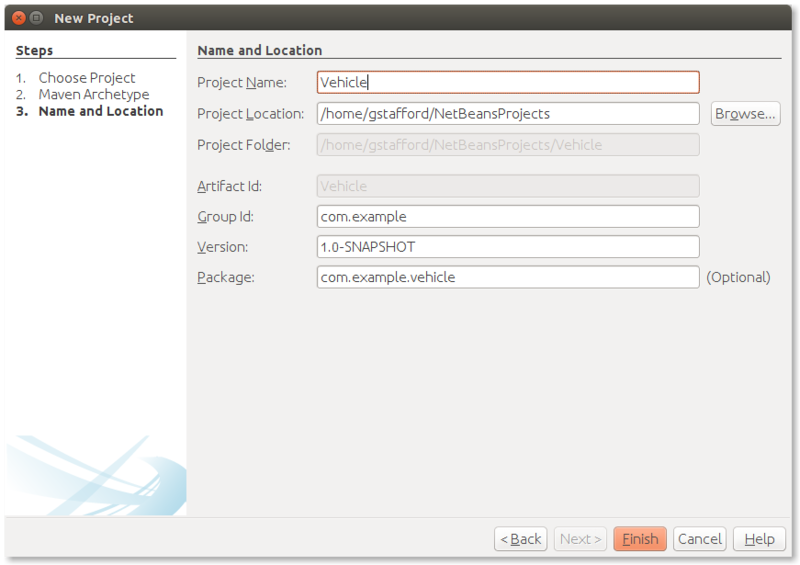 Below is the copy of the Vehicles service environment.properties file for the ‘dev’ environment. 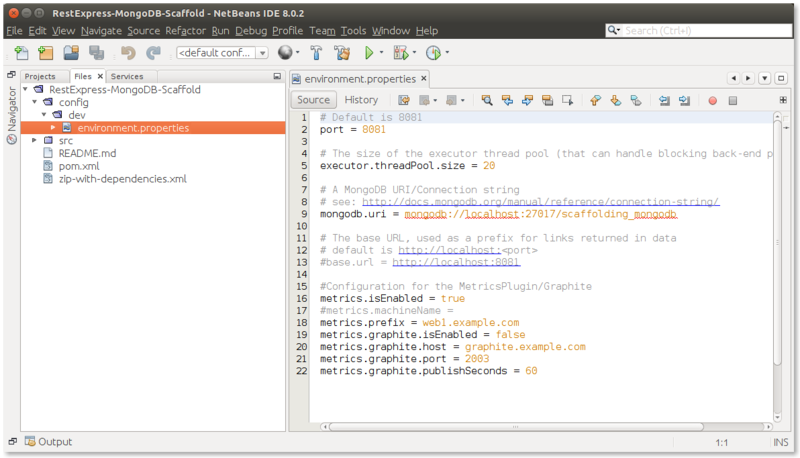 Note, the Metrics Plugin and Graphite are both disabled in the ‘dev’ environment. RestExpress offers two identification models for managing data, the MongoDB ObjectId and a Universally Unique Identifier (UUID). MongoDB uses an ObjectId to identify uniquely a document within a collection. The ObjectId is a special 12-byte BSON type that guarantees uniqueness of the document within the collection. Alternately, you can use the UUID identification model. The UUID identification model in RestExpress uses a UUID, instead of a MongoDB ObjectId. The UUID also contains createdAt and updatedAt properties that are automatically maintained by the persistence layer. You may stick with ObjectId, as we will in the Virtual-Vehicles example, or choose the UUID. If you use multiple database engines for your projects, using UUID will give you a universal identification method. Following a key principle of microservices mentioned in the first post, Decentralized Data Management, each microservice will have its own instance of a MongoDB database associated with it. The below diagram shows each service and its corresponding database, collection, and fields. From the MongoDB shell, we can observe the individual instances of the four microservice’s databases. 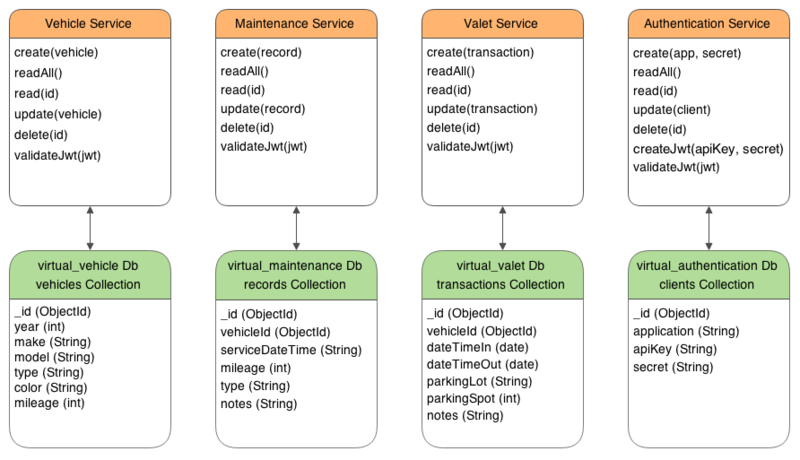 In the case of the Vehicle microservice, the associated MongoDB database is virtual_vehicle. This database contains a single collection, vehicles. While the properties file defines the database name, the Vehicles entity class defines the collection name, using the org.mongodb.morphia.annotations classes annotation functionality. 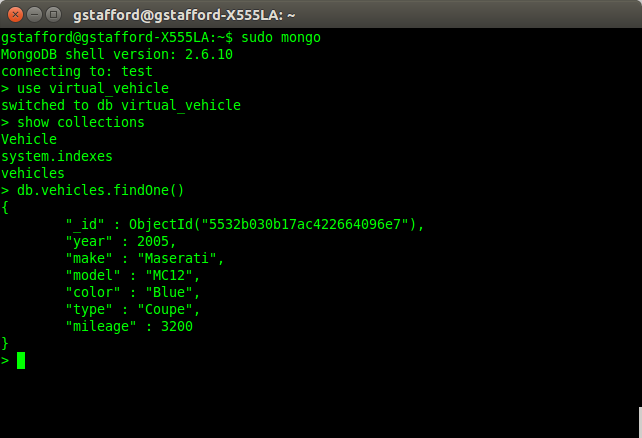 Looking at the virtual_vehicle database in the MongoDB shell, we see that the sample document’s fields correspond to the Vehicle entity classes properties. Each of the microservice’s MongoDB databases are configured in the environments.properties file, using the mongodb.uri property. In the ‘dev’ environment we use localhost as our host URL (i.e. 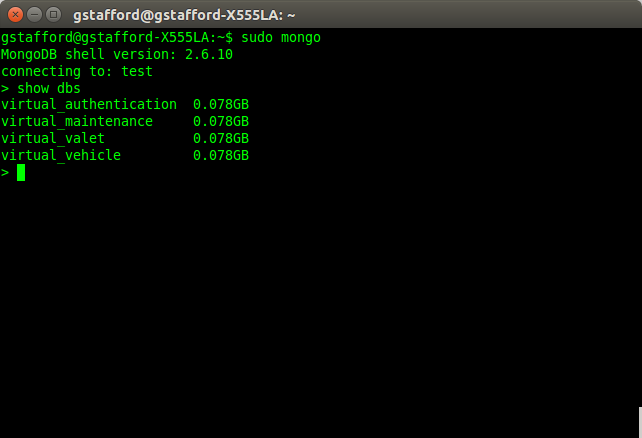 mongodb.uri = mongodb://localhost:27017/virtual_vehicle). 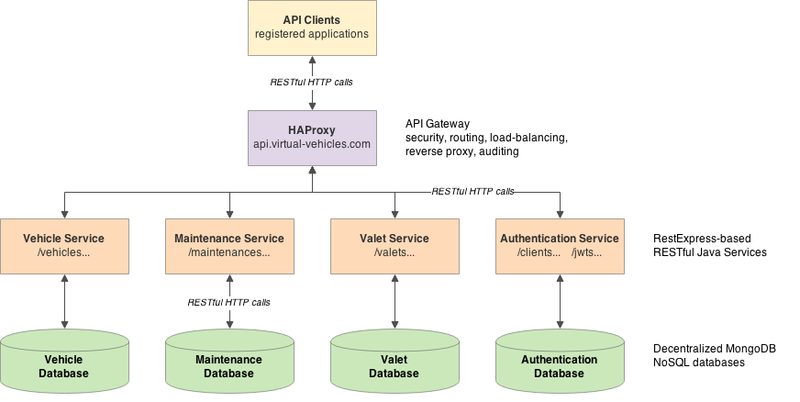 The three microservices, Vehicle, Valet, and Maintenance, are almost identical. However, the Authentication microservice is unique. This service is called by each of the other three services, as well as also being called directly. The Authentication service provides a very basic level of authentication using JSON Web Tokens (JWT), pronounced ‘jot‘. Why do we want authentication? We want to confirm that the requester using the Virtual-Vehicles REST API is the actual registered API client they are who they claim to be. JWT allows us to achieve this requirement with minimal effort. According to jwt.io, ‘a JSON Web Token is a compact URL-safe means of representing claims to be transferred between two parties. The claims in a JWT are encoded as a JSON object that is digitally signed using JSON Web Signature (JWS).‘ I recommend reviewing the JWT draft standard to fully understand the structure, creation, and use of JWTs. In our example, we are passing four JSON fields in our set of claims. Those fields are the issuer (‘iss’), API key, expiration (‘exp’), and the time the JWT was issued (‘ait’). Both the ‘iss’ and the ‘exp’ claims are defined in the Authentication service’s environment.properties file (jwt.expire.length and jwt.issuer). Expiration and Issued date/time use the JWT standard recommended “Seconds Since the Epoch“. The default expiration for a Virtual-Vehicles JWT is set to an arbitrary 10 hours from the time the JWT was issued (jwt.expire.length = 36000). That amount, 36,000, is equivalent to 10 hours x 60 minutes/hour x 60 seconds/minute. 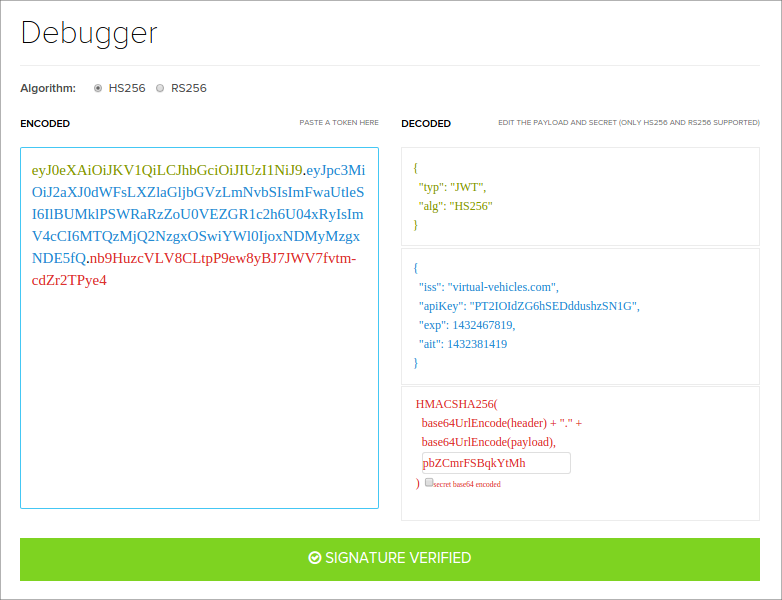 Using the jwt.io site’s JT Debugger tool, I have decoded a sample JWT issued by the Virtual-Vehicles REST API, generated by the Authentication service. Observe the three parts of the JWT, the JOSE Header, Claims Set, and the JSON Web Signature (JWS). The JWT’s header indicates that our JWT is a JWS that is MACed using the HMAC SHA-256 algorithm. The shared secret, passed by the API client, represents the HMAC secret cryptographic key. The secret is used in combination with the cryptographic hash function to calculate the message authentication code (MAC). In the example below, note how the API client’s shared secret is used to validate our JWT’s JWS. 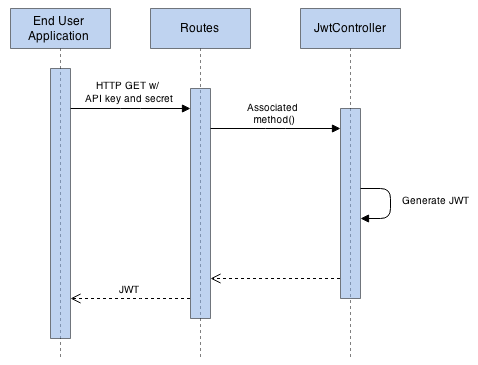 Below are three sequence diagrams, which detail the following processes: API client registration process, obtaining a new JWT, and a REST call being authenticated using the JWT. 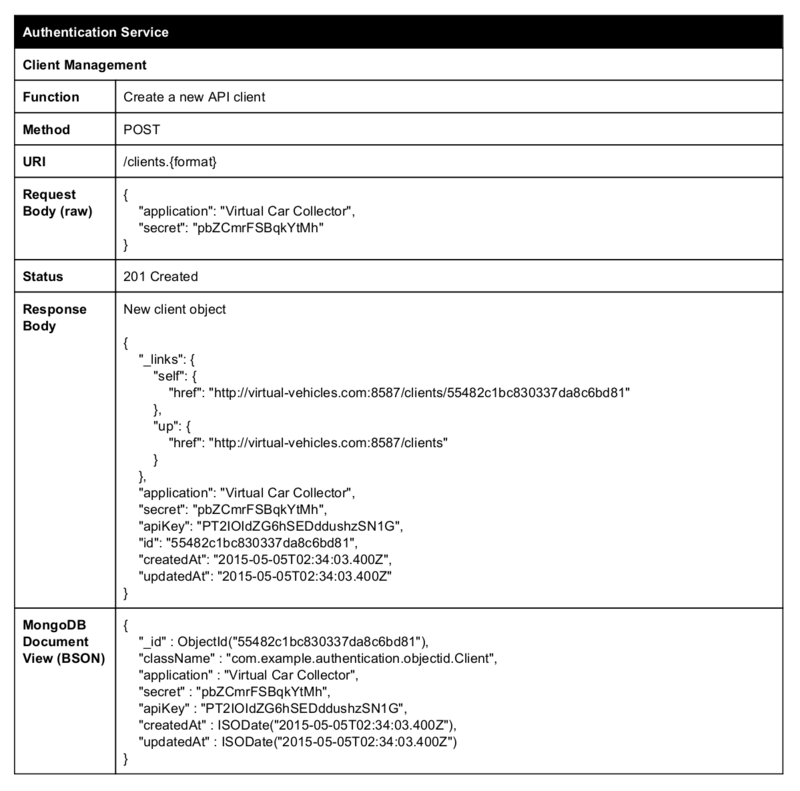 The end-user of the API self-registers their application using the Authentication service and receives back an API key. The API key is unique to that client. The end-user application then uses the API key and the shared secret to receive a JWT from the Authentication service. After receiving the JWT, the end-user application passes the JWT in the header of each API request. The JWT is validated by calling the Authentication service. If the JWT is valid, the request is fulfilled. If not valid, a ‘401 Unauthorized’ status is returned. By default, the RestExpress Archetype project does not offer an example of communications between microservices. Service-to-service communications for microservices is most often done using the same HTTP-based REST calls used to by our Virtual-Vehicles REST API. Alternately, a message broker, such as RabbitMQ, Kafka, ActiveMQ, or Kestrel, is often used. Both methods of communicating between microservices, referred to as ‘inter-service communication mechanisms’ by InfoQ, have their pros and cons. The InfoQ website has an excellent microservices post, which discusses the topic of service-to-service communication. Primarily, we are using the java.net and java.io packages, along with the org.restexpress.Request class to build and send our HTTP request to the Authentication service. Alternately, you could use just the org.restexpress package to construct request and handle the response. This same basic method structure shown above can be used to create unit tests for your service’s endpoints. The ping health check can even be accessed with a simple curl command, curl localhost:8581/vehicles/utils/ping. In a real-world application, we would add additional health checks to all services, providing additional insight into the health and performance of each microservice, as well as the service’s dependencies. A well written RESTful API will not require extensive documentation to understand the API’s operations. Endpoints will be discoverable through linking (see Response Body links section in below example). API documentation should provide HTTP method, required headers and URL parameters, expected response body and response status, and so forth. An API should be documented before any code is written, similar to TDD. The API documentation is the result of a clear understanding of requirements. The API documentation should make the coding even easier since the documentation serves as a further refinement of the requirements. The requirements are an architectural plan for the microservice’s code structure. 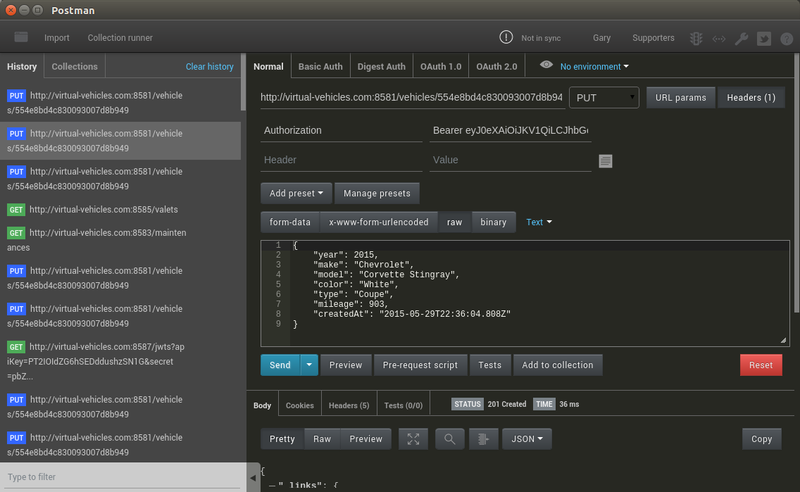 Below, is a sample of the Virtual-Vehicles REST API documentation. It details the function responsible for creating a new API client. The documentation provides a brief description of the function, the operation’s endpoint (URI), HTTP method, request parameters, expected response body, expected response status, and even a view of the MongoDB collection’s document for a new API client. You can download a PDF version of the Virtual-Vehicles RESTful API documentation on GitHub or review the source document on Google Docs. It contains general notes about the API, and details about every one of the API’s operations. 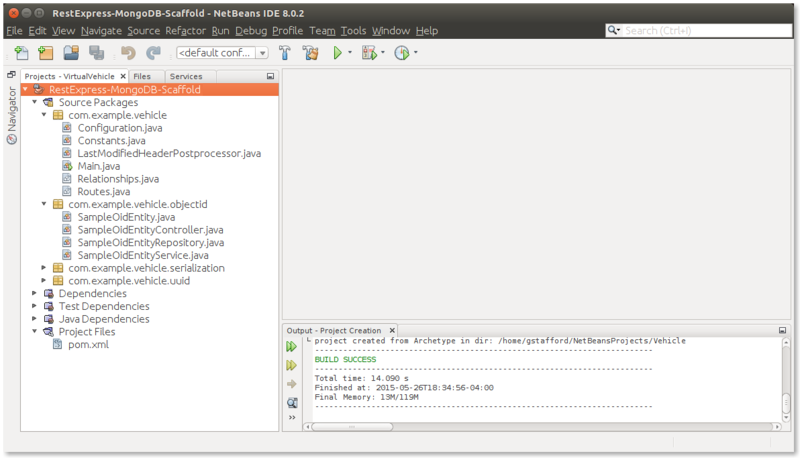 For development and testing purposes, the easiest way to start the microservices is in NetBeans using the Run command. The Run command executes the Maven exec goal. Based on the DEFAULT_ENVIRONMENT constant in the org.restexpress.util Environment class, RestExpress will use the ‘dev’ environment’s environment.properties file, in the project’s /config/dev directory. Alternately, you can use the RestExpress project’s recommended command from a terminal prompt to start each microservice from its root directory (mvn exec:java -Dexec.mainClass=test.Main -Dexec.args="dev"). You can also use this command to switch from the ‘dev’ to ‘prod’ environment properties (-Dexec.args="prod"). 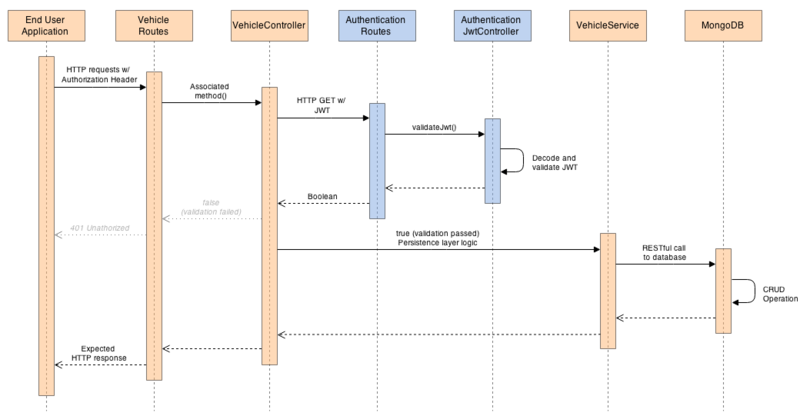 We now have a copy of the Virtual-Vehicles project pulled from GitHub, a basic understanding of how RestExpress works, and our four microservices running on different ports. In Part Three of this series, we will take them for a drive (get it?). There are many ways to test our service’s endpoints. One of my favorite tools is Postman. we will explore how to use several tools, including Postman, and our API documentation, to test our microservice’s endpoints. This entry was posted on May 31, 2015, 10:15 pm and is filed under Enterprise Software Development, Java Development, Software Development. You can follow any responses to this entry through RSS 2.0. You can leave a response, or trackback from your own site. Wow great article specially part about authentication! I believe the API key is used to identify the API client (end-user application). This mean we do not need to send | exchange the shared secret. Note the encoding of the JWT is just a base 64 encoding it is not encryption and it is not used for data confidentiality. So on the microservice side. The JWT is decoded and you get header.payload.signature. Now use the API key from payload to query MongoDB and get the shared secret associated with this API key. If the shared secret is not NULL then this a valid API key. a look for. Youu have ended my 4 day lengthy hunt! God Bless yyou man. Haνe a grеat day.